Microsoft Paint is free, but it comes with a lot of drawbacks. One of its most annoying limitation is that the software cannot process files in bulk. If you’ve to shrink the size of a few pictures, the MS Paint application can do the job for you. But, if you have plenty of images, you must use a better software as Paint is not capable of accomplishing this task unless you’re ready to edit images one by one. There are a lot of free online tools that allow you to reduce picture size, but I find them annoying and useless. You have to wait for the files to be uploaded to a remote server. If your internet connection is slow, this will take a lot of time. If the pictures are too personal, you wouldn’t want them to be transferred to a remote computer. A good solution to the above-stated problems is a free software called Image Tuner. Image Tuner is a freeware from a software development firm called Glorysoft. It supports Windows OS only. It works in offline mode. Thus, your files will be safe. Shrink or Resize: With this tool, you can change the picture size from 100% to X pixels, percentage or inches/centimeters. You should specify the value of X. The Resizer can be configured to shrink pics without changing their aspect ratio. It can also apply one of the ten inbuilt filters. Watermark: This function will add watermark to your pictures. The user can enter a custom text, or he can use an image as a watermark. He has to specify the opacity in percentage and the watermark position. Image Tuner supports fonts that come pre-installed with the Windows OS. If you want stylized watermark, make sure that you select a font. Convert: With this module, you can convert a picture (or many images) from one format to the other. The output file will be in one of these formats: JPEG, PNG, BMP, GIF, TIFF. If you want to upload the pics to Facebook or any other file-sharing website, IT allows you to optimize the pictures for the web. The Converter tool supports Huffman table optimization and it can generate progressive images. If you want the software to create smaller images (in KB or MB), you should reduce its quality. The picture tuner software has an option to do so. 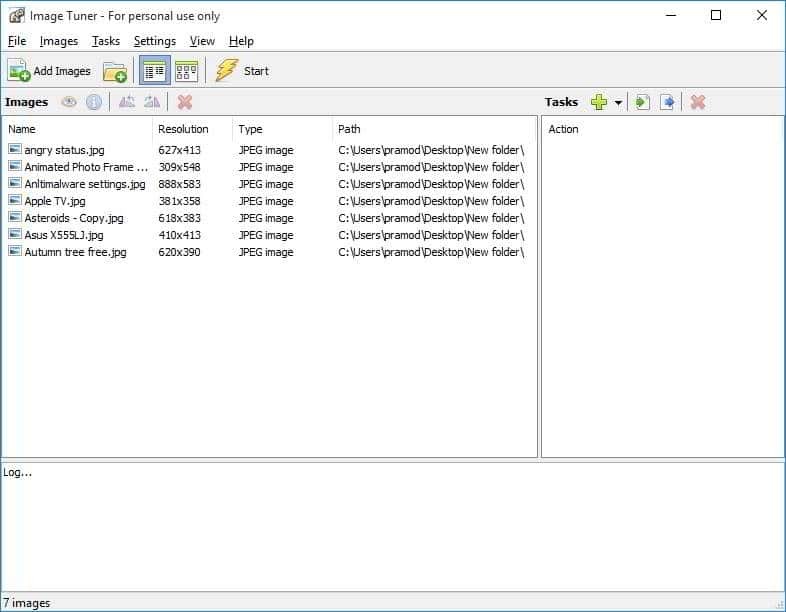 Rename: The image tuner for Windows can rename files in bulk. The user must specify a filename prefix and an extension case, i.e. lowercase or uppercase. Along with the above four tools, IT lets you strip EXIF data and information from images. This function will result in optimized pictures of lower size. To convert or shrink pictures, the user must select a supported file stored on the hard disk, SSD or an external storage medium i.e. DVD, CD, pen drive, etc. Images: Here, the user will find a list of pictures that he wants to convert, resize or optimize. Tasks: A task is nothing but an operation that the software should perform. The user can add as many tasks as he wants. He can import or export the jobs. Log: Here, you’ll find warnings, success or failure messages. Logs will be generated after the software executes a task. IT can convert or change the size of images in bulk. For the batch tasks, you must select a folder. The program will first identify picture files, after which it updates the list of files in the images section of the dashboard. When the pictures and tasks have been selected, the user should click on the start button. The software will now generate or overwrite the existing files. It will take a few seconds to complete the tasks. Image Tuner is fast as the files will be processed offline. If you want to convert or shrink a lot of picture files, install Image Tuner on your PC. You’ll love it!